The city of Pisa rises above the banks of Arno, just before the mouth of the river at Marina of Pisa. It is one of the most important cities in Tuscany and it is extremely well-known in the world, because of its famous symbol: "the Leaning Tower". 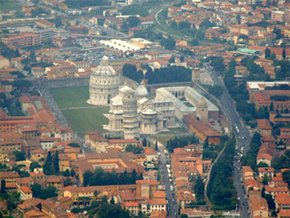 Pisa is both an ancient and modern city. On the one hand, it is proud of its past , when it was a Marittime Republic and became a world power during the Middle Ages. On the other hand, now is famous for having three of the most important universities in Italy: The Scuola Normale Superiore, the Sant' Anna school of Advanced Studies and the University of Pisa. If you want to know more about Pisa, we will guide you through a virtual voyage to the marvellous banks of Arno, in the majestic Duomo or in its special museums such as: the Saint Matteo's museum or that one of Duomo. Pisa can be considered also an international city, due to the intercontinental Galileo Galilei Airport that joints it to anywhere in the world. There are also curiosities about Pisa: in the city there isn't only one leaning Tower, but there are other two, also: the Bell Tower of San Nicola Church which is near the banks of Arno and the whole church of San Michele of Scalzi.